Pack size: 1 contact lens case. Contact lenses are tricky little things, and it's easy to misplace them. It's also vital that they are stored properly when disinfecting or cleaning, making specialist lens cases vital. This Barrel Contact Lens Case is just such a case. Engineered from strong materials, it can take a drop onto the floor without damage. It has also been fashioned to fit contact lenses neatly and allow for an all-over deep clean, so that every portion of the lens is left free of dirt, grease, grime and germs. • The Barrel Contact Lens Case has been designed to be used as a storage vessel for contact lenses. Use overnight to cleanse lenses and disinfect them to prevent eye infections. • The Barrel Contact Lens Case can also be used to store contact lenses safely without damaging them for when you do not need to wear them. • It is recommended that lens cases are replaced every three months to ensure a hygienic environment for lens storage. 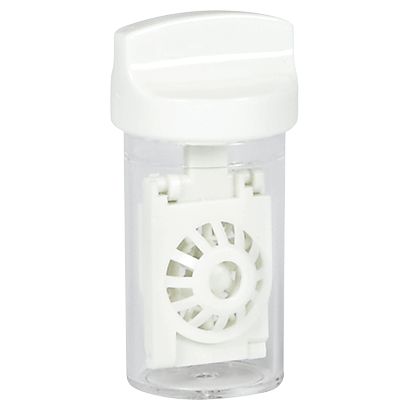 • The Barrel Contact Lens Case is not designed for use with cleaning solutions which contain Hydrogen Peroxide. Specialist cases can be found to use with these products. 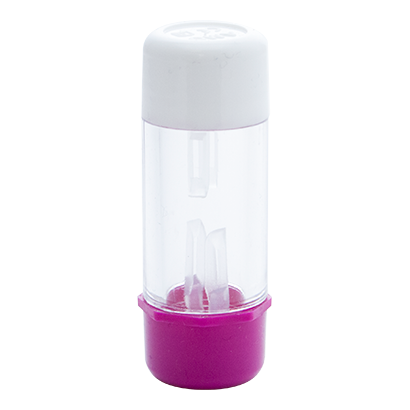 Cleaning contact lenses will be easier than ever with this effective storage product. Simply place lenses in the lens case overnight for optimum vision and disinfection.